Fantastic Welsh traditional dress features on this card. Julia was my new best friend at the school I joined when we moved, she lived just down the road and made me feel very welcome. Julia was bright and clever -see how she’s broken up her holiday report with a question back at me. I was only at that school for one term before we all moved on to senior school. Julia went to a different one and we both made new friends. It was difficult to maintain the friendship with Julia and we lost touch. On reflection, this was probably more my fault than hers. A classic status update from my paternal grandparents to my brother and me. 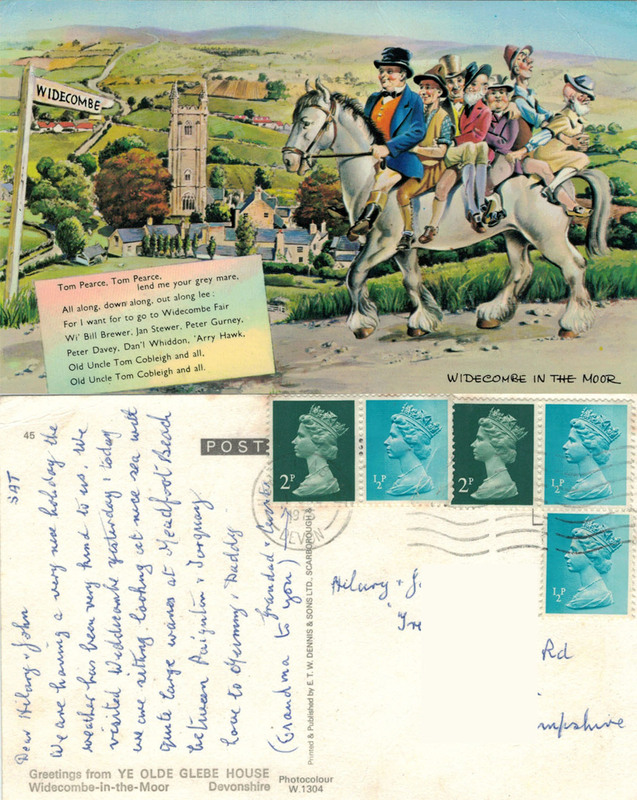 The postmark date is Newton Abbot, 1 June 1975. 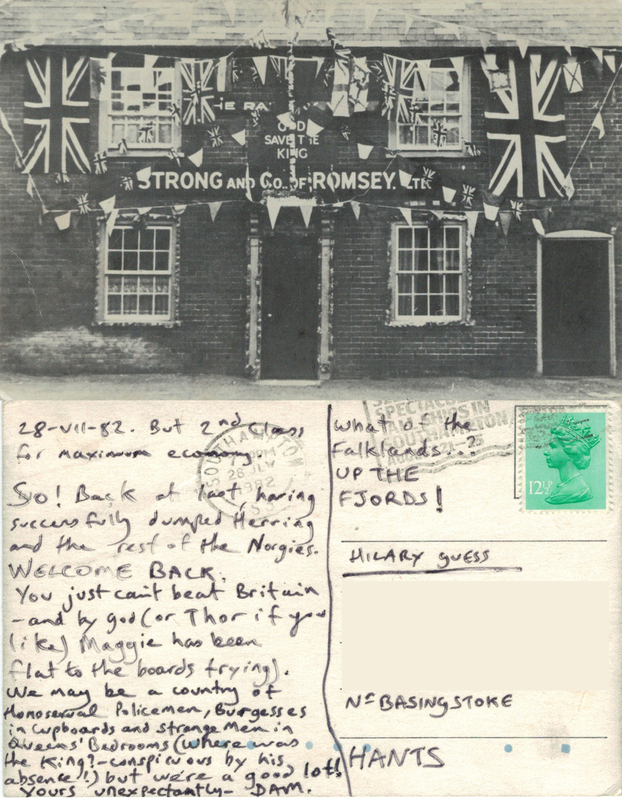 Five stamps adding up to 5½p which was the cost of sending a postcard second class in 1975 (this is approximately 50p in 2014). Tom Pearce, Tom Pearce, lend me your grey mare, All along, down along, out along lee; For I want to go to Widecombe Fair Wi’ Bill Brewer, Jan Stewer, Peter Gurney, Peter Davey, Dan’l Whiddon, ‘Arry Hawk, Old Uncle Tom Cobleigh and all, Old Uncle Tom Cobleigh and all. 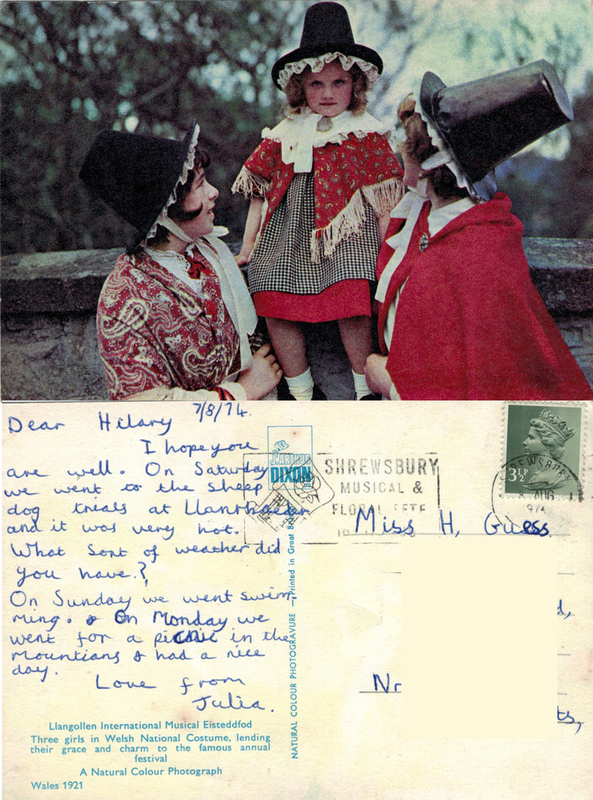 Another postcard from my childhood – the postmark date is 9 August 1974. We moved areas earlier in 1974 and it took me a long time to settle in my new school. My friend Ida was committed to keeping me up to date with news from my old friends. 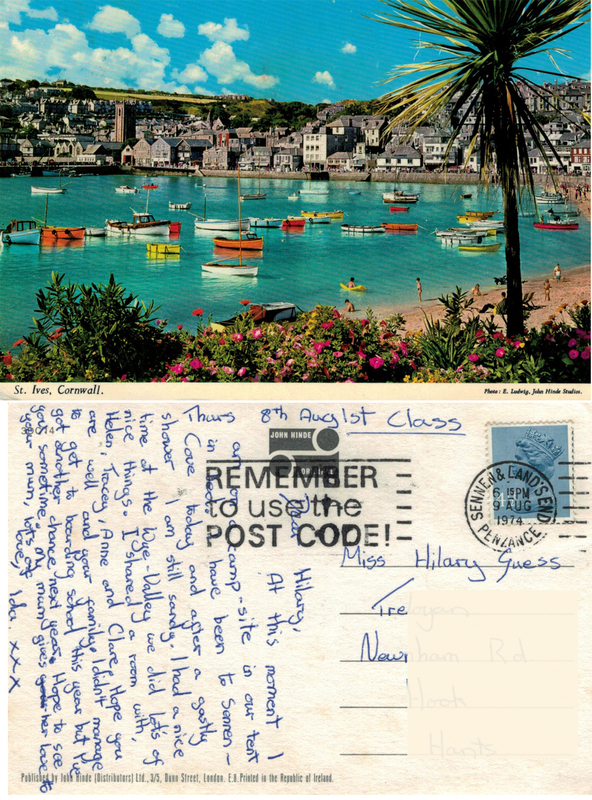 The other postmark is still asking us all to ‘Remember to use the post code’ which by 1974 was supposed to be included on all addresses. As I recall, it was quite hard trying to find out what the correct post codes were. St Ives is still a popular destination for tourists and artists. The photo appears to have been enhanced by tropical vegetation – I think the main shot has been taken from the end of the harbour wall where there are no plants. Does anyone have any thoughts on this? Ida and I were at infant school together, we have not seen each other for over 20 years, but continue to enjoy catching up via regular exchanging of Christmas cards.